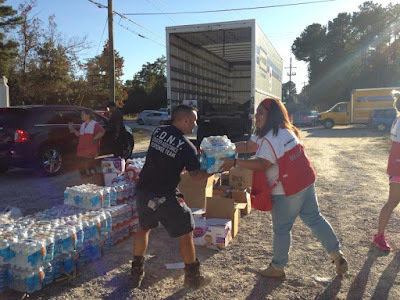 The FDNY Disaster Assistance Relief Team in South Carolina with Red Cross helping out after flooding. Over the last 7 days, the Greater New York Red Cross provided emergency assistance to 81 adults and 35 children following 43 local disasters. Here are some highlights from last week and a preview of upcoming activities (see below). In the last 24 hours, Metro New York North Red Crossers have been busy responding to a large number of fires: in Mt. Vernon, Jeffersonville, Newburgh and Loch Sheldrake. Emergency assistance is being provided to those affected residents who need it. 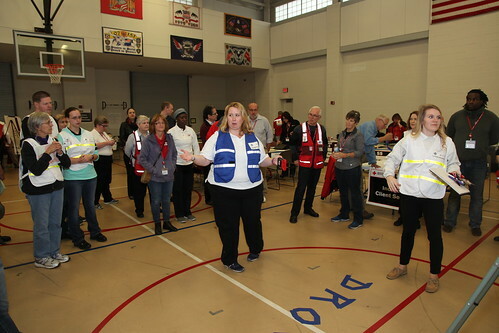 On Saturday, the entire Greater New York Red Cross region, spanning Metro New York North to Long Island, conducted a full-scale disaster exercise simulating a 6.5 earthquake in New York City. Thanks to everyone who participated in the drill! On Thursday, as part of our #MyRedCrossLife Instagram series, volunteer superstar Sue Rogers shared her thoughts on the impact that volunteering has had on her life. On Wednesday, the Greater New York Red Cross held its annual Honoring Our Heroes Gala at Gotham Hall. Throughout the night, Red Cross supporters as well as local and national heroes were celebrated for their humanitarian spirit. Among those on hand at our Gala was Bill Cunningham of the NY Times. A few of his photos were featured in yesterday’s Style section. Prior to our Gala, we shared the story of Blake Farber who, alongside a small group of New Yorkers, came to the aid of a restaurant worker trapped in the basement of an East Village building that exploded last March. Early Tuesday morning, the Red Cross responded to a tragic fire in Central Nyack and provided emergency assistance for 3 families living in the building. During the final week of Citibike for Good, we posted an interview with Red Cross volunteer and avid cyclist Richard Sanford. Early Monday morning, members of FDNY DART deployed to South Carolina to support Red Cross flood relief operations in the area. Win a Deluxe Emergency Preparedness Kit by taking the online emergency preparedness training. You’ll be automatically entered to win. This contest is open to residents of New York City, Long Island, Orange, Sullivan, Rockland, Putnam and Westchester Counties. Four winners will be chosen each month (notified via email). Oct 19, 21, 22: Red Cross blood drives; 1 to 7pm; 520 West 49th Street, Manhattan. Schedule an appointment to donate today. Oct 21: For Red Cross volunteers, sign up for one of our Home Fire Safety Academy Level I training. We’ll cover the basics of fire safety education and each of the technician roles needed for our Home Fire Preparedness Campaign. This is the best way to get prepared for our October 24th Installation Event. Check out the training calendar and register here!